This elegant toiletry roll unfolds into four detachable, see-through compartments. Keep your make up brushes and cosmetics separate from your toothbrush and toiletries, then easily consolidate when you’re done. Use the built-in hanger to free up sink space. 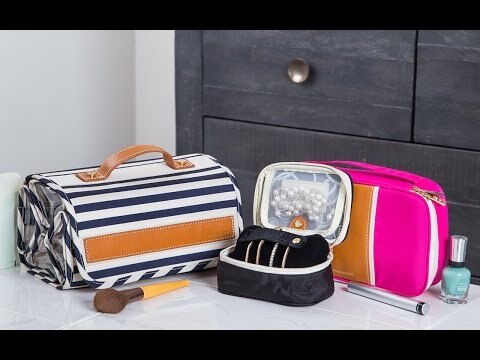 You can even slip a detachable pouch in your purse as an ad-hoc makeup bag. The Delilah will add a touch of smart to your day-to-day. 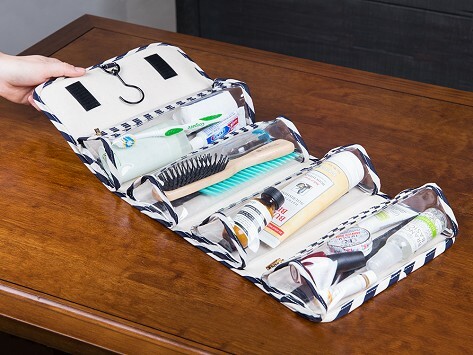 Dimensions: Rolled: 10" x 5.5" x 4.5"; Expanded: 25" x 10" x 2.5"
Nice looking bag helps stay organized on the go. Quality construction and versatile options.